All transactions are safe and secure with a reliable history in online purchasing behind each of our associates. 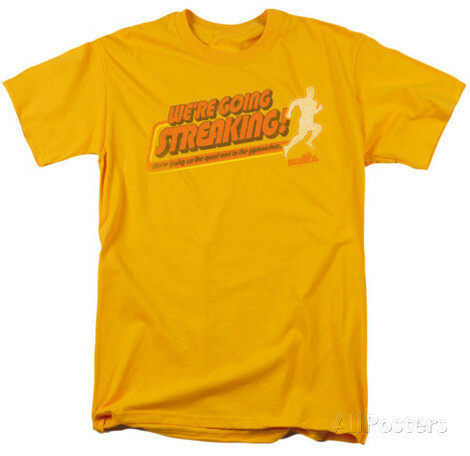 Buy the We're Going Streaking t-shirt to own Old School clothing and merchandise. Gather up your friends because it's time to go streaking! This Old School t-shirt is a great party tee, as long as you don't get too drunk and go streaking through town by yourself. Remember, always streak in groups. It's much more fun and your wife is less likely to see you. This official t comes in yellow with orange lettering and is available in standard sizes up to 3XL. In addition to the We're Going Streaking tee above, browse the Old School Clothing Gallery for more apparel like men's and women's clothes, kids shirts or hoodies.